I spent summer moving cities and am now firmly ensconced in Wellington. Of the many joys I’ve discovered about living in Wellington as an adult there are two aspects of the city I don’t much care for; the weather and the airport. Despite my love of travelling around the world I don’t do well with flying. And by don’t do well I mean absolutely petrified. Landings are the part of the flight I dread the most. It feels like someone is trying to stick a needle in my ear drums when a plane starts to descend. Plus there’s several hundred thousands tons of metal hitting the ground at speed which is always accompanied by the terrifying, albeit slim, possibility of dying in a giant fireball. 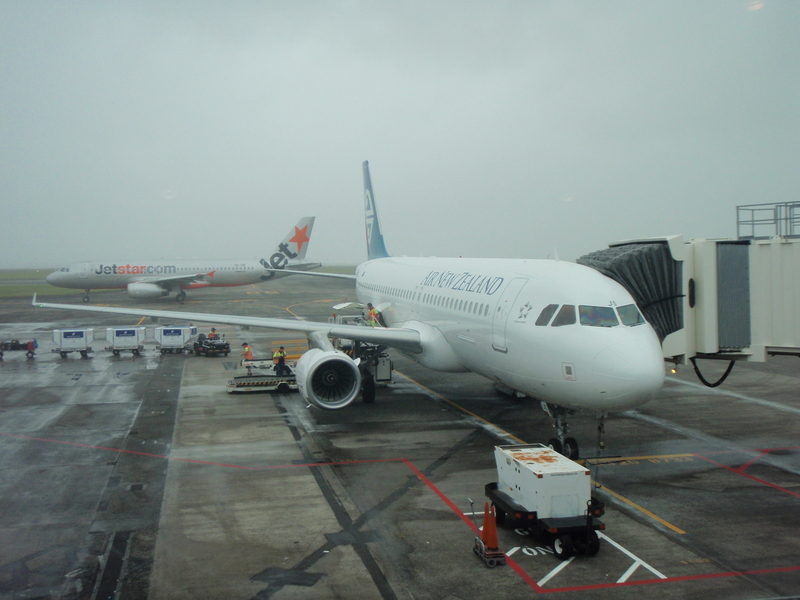 The relief of landing safely at my destination after a bumpy landing has on occasion made me ponder whether I should kiss the ground after I emerge from an aircraft and those occasions almost always occur at Wellington airport. Of the dozens of airports I’ve flown into around the world Wellington defintely rates as one the scariest. The runway is short and the capital’s foul weather make for a bad combination for a paid up member of the nervous flyer brigade. Wellingtonians are a curious breed and seem to take the ability to not flinch during violent landings as something to be proud of. A few years back the airport company decided to re-brand itself ‘Wild at Heart’ and the local paper declared making it onto the Guardian’s list of the world’s scariest airports would be great for tourism. So after a weekend of final goodbyes in Auckland a few weeks ago I was dismayed to discover that weather forecast was for gale-force southerly winds and rain for my flight down to my new home. Hmmph. I knew that meant I was in for a white-knuckled ride. Sure enough my flight departed Auckland on time but the arrival was late. Almost four hours late. Or more specifically Wellington’s weather which meant the aircraft couldn’t land. Though not through lack of trying. The plane started to descend. Glup. Then spent 20 minutes spent flying over Tory Channel due to a thunderstorm over the airport. Gasp! A sudden revving up to the engines signalled a diversion back to Auckland to refuel and recrew. Argh!! There was another landing attempt before a go-around was announced by a rapid ascent. GAAAH!!! Finally after what seemed like hours on final approach battling against the southerly the aircraft finally touched down to applause and relief of the passengers. I’M NEVER FLYING AGAIN NOW SOMEONE FIND ME SOME GROUND TO KISS!!!! A few weeks after the flight that wouldn’t end, I decided that the actions of the people looking after the plane and its passengers was full of teachable moments for a beginning teacher. 1. Communicate with those around you. After each unexpected turn in the journey, the crew in the cabin and the flight deck always told us where we were going and why. This took some of the nerves away when I looked at my watch and wondered why I wasn’t on the ground. Teachable moment: be clear with your learning intentions and let kids know why you might need to try things again. 2. Always have enough gas in the tank. Obviously not having enough actual fuel has some rather dire consequences for planes but it’s also important for the people operating them to take time to refuel. That’s why our second flight was staffed by an entirely different crew. Teachable moment: Take your time to get the job right and get help when you feel yourself getting overwhelmed. 3. A sense of humour is a must. Air NZ has cultivated a bit of a reputation for its tongue in cheek advertising. However the airline’s quirky sense of humour turned an annoying situation (for those passengers wanting to get some sleep before their first day of work) and utterly terrifying situation (for me) into one where most of the passengers were laughing at our mishaps. Teachable moment: Laughing is a lot more fun than panicking when faced with a stressful situation. 4. Sometimes things just come down to luck. That night other planes managed to land or at least didn’t get turned back . In fact the black plane that I spotted when we took off from Auckland for a second time had made it into Wellington before my plane which didn’t seem fair. However I’ll take a late, safe landing over the alternative any day. Teachable moment: focus on what really matters. 5. Jet planes and cookies. The extra time in the air meant no dinner for me and I’m sure I wasn’t the only passenger whose stomach was rumbling and not just from nausea. Yet somehow getting the jet planes and cookies instead of choosing one option made up for it. Teachable moment: do the best with what you have. So thanks to the wonderful crews of flight 463 from January 8 who did so well under trying circumstances. They kept everyone laughing especially the nervous flyer in 17C. Hopefully by the time the school holidays roll by I’ll be ready to fly again. Thanks so much Sandy! I hope you enjoy your first year of teaching as well! Glad you made it with sense of humour firmly intact 😉 Congratulations on being registered too. I’m excited for you and look forward to reading what happens next. The humour took a while to return! But thanks, am a little nervous + excited. Just chuckling over this post that I missed. I hate flying too, and like you have flown around various places in the world. I hate the take off as well! Over the years I have got used to flying but never really enjoy it totally. Although do enjoy good views of Wellington on a fair weather day! Haven’t had the experience of a bad landing in Wellington and neither do I! Love how you have turned it around into wisdom for life and teaching.